I wanted to make something rich and lush and satisfying and this was exactly the right thing. I was afraid the cheese would totally melt away in this, but there was still some present in the chicken. And what did melt away was there in the sauce, giving it some creaminess. The spinach gave it good color and a little texture. The prosciutto just sent it to another level for me. I love prosciutto. 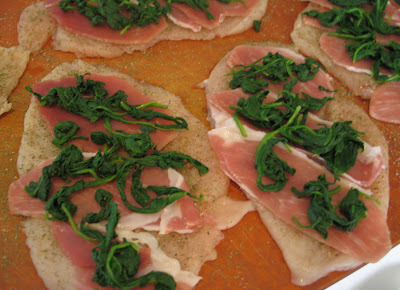 I would guess you can use sliced ham instead of prosciutto. I also think I may try this again and substitute mushrooms for the spinach. That might give it an earthier flavor. Or some asparagus spears to give it a brighter flavor. But for last night, this was perfect. Heat large oven-safe skillet and cook spinach about 1 minute or until wilted. Save this skillet, the chicken will cook in this. Put spinach in colander and rinse with cold water until cool. Squeeze out as much liquid as possible. 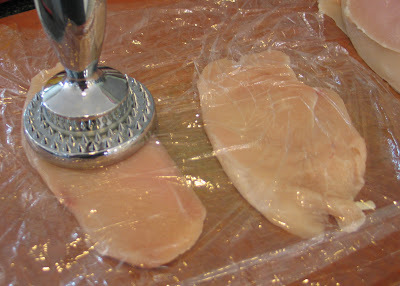 If using thicker pieces of chicken, pound them into thin pieces. I put the chicken between sheets of plastic wrap. This way I can see them, but the mess is contained. Season cutlets with salt and pepper then sprinkle with the dill. Layer prosciutto evenly over chicken. Layer spinach evenly over that. Crumble Boursin over that. Reserve the 5th piece to be used in the sauce later. Roll cutlets and secure with toothpicks in 2-3 places. My toothpicks were sticking out a lot so that it would make it difficult to turn them to cook. So I cut them off to be more flush with the top of the chicken. They can be removed before serving. Season outside with salt and pepper and then dust with flour, shaking off excess. Wipe any moisture out of skillet then heat olive oil on high heat. Add chicken, seam side down. Cook until browned on bottom, about 4-5 minutes, then turn chicken. Cook about 2-3 more minutes or until browned. Turn so they are seam side down again and add the wine and broth. Cover and bake in the oven for 12 more minutes, until chicken is done. Remove from oven and transfer chicken to a platter. Remove toothpicks and cover with foil. Transfer skillet to the cooktop and heat on high. Add the cornstarch mixture and whisk until it starts to thicken. Add remaining piece of Boursin and whisk until blended. To serve this I cut the chicken down the middle and poured the sauce down into it. I served this with roasted shoestring potatoes with rosemary and lemons. For veggies, keep it simple with steamed green veggie like broccoli or asparagus. The sauce is rich. The sides can be much more simple. This would be excellent dinner party food. You can get the chicken assembled up to just before you dust them with flour and keep them in the fridge. When you want to cook them, remove from the fridge and let stand about 10 minutes. Dust them with flour and cook according to the recipe. This is how I did it and they were perfect. I served this as a side dish to a rich, creamy chicken dish. 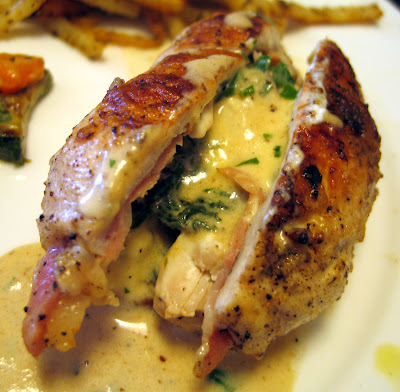 The simple, crisp flavors of rosemary and lemon were a great balance to the chicken stuffed with prosciutto, spinach and boursin. It was easy, with the most time-consuming part being cutting the potatoes and then soaking and rinsing them several times to remove the starch. Removing the starch helps them crisp up more. Clean potato skins thoroughly, but leave skin on. Slice potatoes into 3/8-inch thick slices. Cut slices into 3/8-inch think sticks. Alternate rinsing and soaking potato slices in cold water until water runs clear. Let potatoes rest in cold water for 5 minutes. Drain completely and spread potatoes on towels or paper towels. Cover with another towel or some paper towels and let dry. 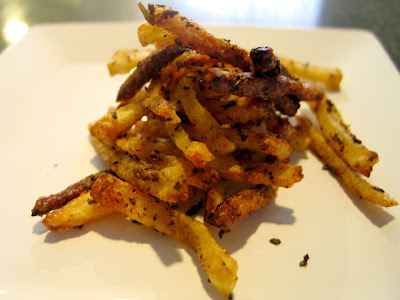 While potatoes are drying, combine olive oil, mustard, zest, lemon juice, salt and pepper in a medium bowl. Add potatoes to bowl and toss/mix gently until each piece is coated. Spread potatoes in single layer on baking sheet. I used two baking sheets. Bake until browned on the bottom, about 10-15 minutes, then turn. Bake in single layer until the other side is as brown and crispy as you want them, turning every 5 minutes. I like mine crispy, so I baked them at least another 10-15 minutes, turning them a couple times. Sprinkle with more salt to taste. Can it possibly be that I have not cooked anything since July 23, the date of the last post? I have cooked, just nothing too exotic or new. Plus there was that little matter of being gone on vacation for a bit longer than a week. And I shall cook again. I am thinking Monday will be a good day to really break out with something new since I am off work and can spend some time thinking about it. 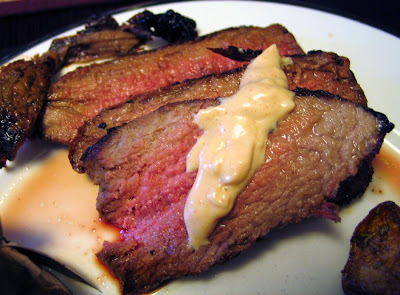 But for now, I give you a recipe that I made once before going on vacation and once since being home: grilled tri tip with smoked paprika mayo. I adapted this from another recipe, as I so often do. The original recipe, which used tenderloin instead of tri tip was in the July 2008 issue of Gourmet magazine. I used tri tip because it was waaaaaaaay less expensive than the tenderloin. Mince garlic and then mash with salt. 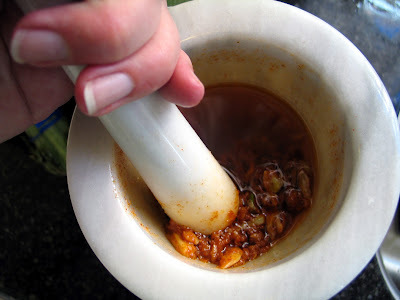 I use a mortar and pestle, you also can use the back of a spoon. Stir in smoked paprika, cumin, pepper and oil. 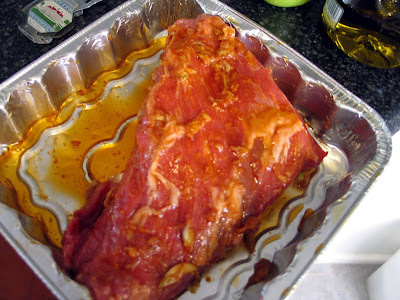 Pat tri tip dry and rub with garlic-paprika mixture to coat. You can cook it right away or let it sit. I let mine sit at least a couple hours. Cook meat on one side to get a nice sear and coating then flip it over to sear the other side. Lower heat to medium and cook until done. Meat should have a center temperature of 125-130 degrees with a meat thermometer. This should give you a meat cooked to medium in the center. The ends will be more well done. 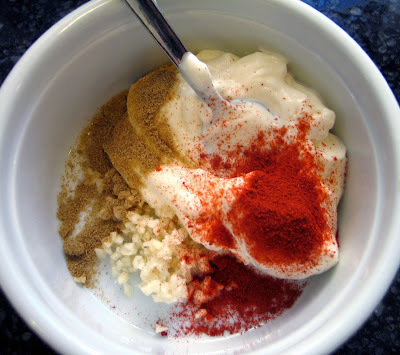 Remove meat from grill and let rest while you make the mayo. Reserve any juices to use in the mayo. Stir together all ingredients and then add in reserved juice from the meat if you want it. I did one with the juice and one without when I cooked this. Both times it was really tasty. And the mayo will keep in the fridge for a couple weeks. I used some of the leftovers on grilled portabello mushroom sandwiches. It was excellent. Slice the meat thinly and on an angle. Serve warm or at room temperature with the mayo. Leftovers of this are yummy and would make excellent sandwiches. The second time I made it I used the leftover meat, chopped up, to make carne asada tacos.